Bodum is famous for creating magic glass vessels for your coffee, and the Bistro 15 oz Double Wall Coffee Mugs are no exception. This coffee mug holds almost two cups of your favorite hot drink or - surprisingly - a cold one. 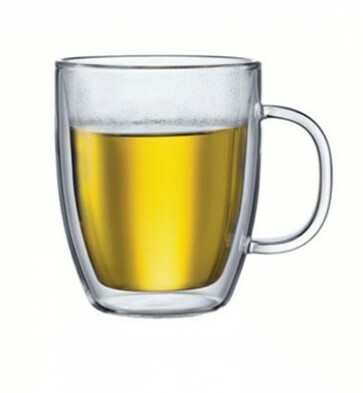 Crafted of a strong but lightweight borosilicate glass, this mug is both dishwasher and microwave safe, and can be placed on any surface without a coaster. So light that you'll swear that you're lifting air, all while keeping your hands safe from the piping espresso goodness inside the mug. Burn Free - This coffee mugs double wall feature is great as it protects your fingers from getting burned by your piping hot cup of java..